As if finding Korean BBQ buffet that costs RM24/~S$7.97 at JB Mount Austin wasn’t enough, we also managed to score ourselves another cheap and good find at Kafe Eat & Repeat. 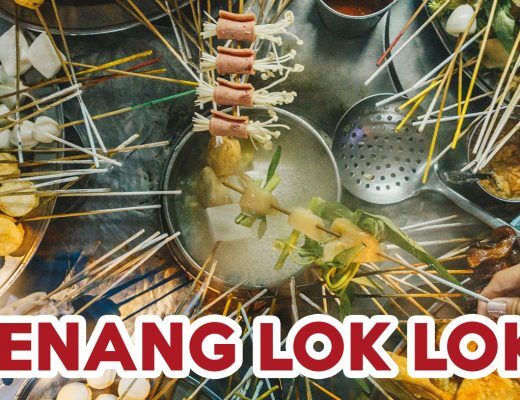 This eatery is the seventh branch in Malaysia, showing how both the boat noodle concept and food served are so well-received here. We spread the net wide and ate everything on the menu, so we could whittle down the very best dishes to order when you’re here. What I love about this place is the boat-noodle dining concept, which transcends past the history of boat merchants in Bangkok’s canals. 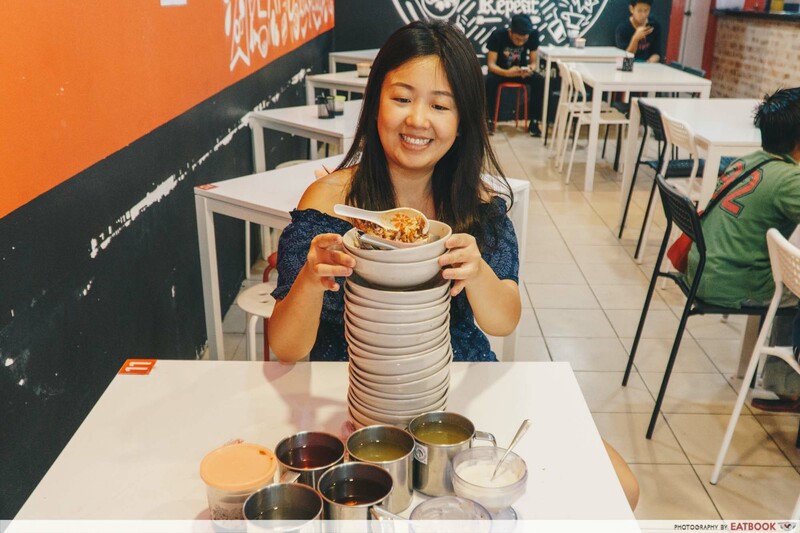 There might not be any rocking boats here or Thai food even, but each dish is portioned and served in little bowls at only RM1.90/~S$0.63 a pop! If you’re always suffering from food envy, Kafe Eat & Repeat allows you to try everything on the menu. 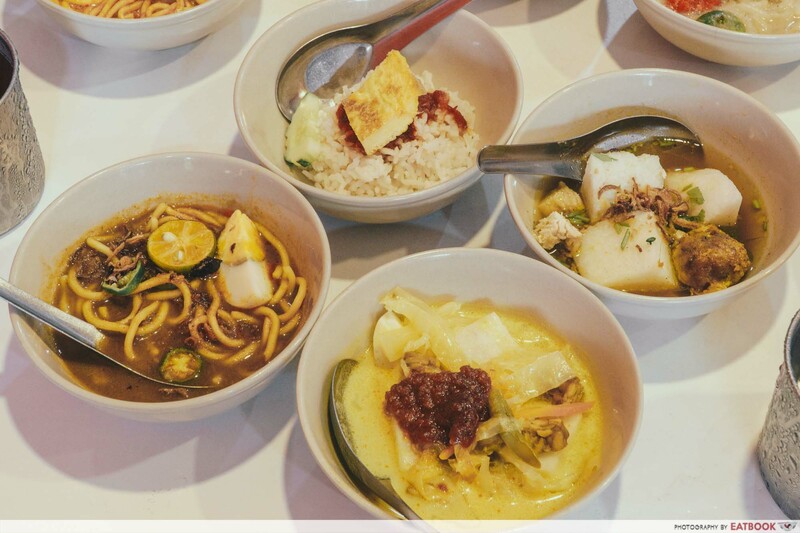 The classic varieties are Lontong, Mee Rebus, Nasi Lemak, and Soto, the lattermost being the most popular dish at the table. This is mostly attributed to the little ball of begedil found amongst cubes of rice cake. The deep-fried patty is a savoury parcel of mashed potatoes and fried shallots. When paired with the intensely flavoured chicken broth, they were simply moreish. 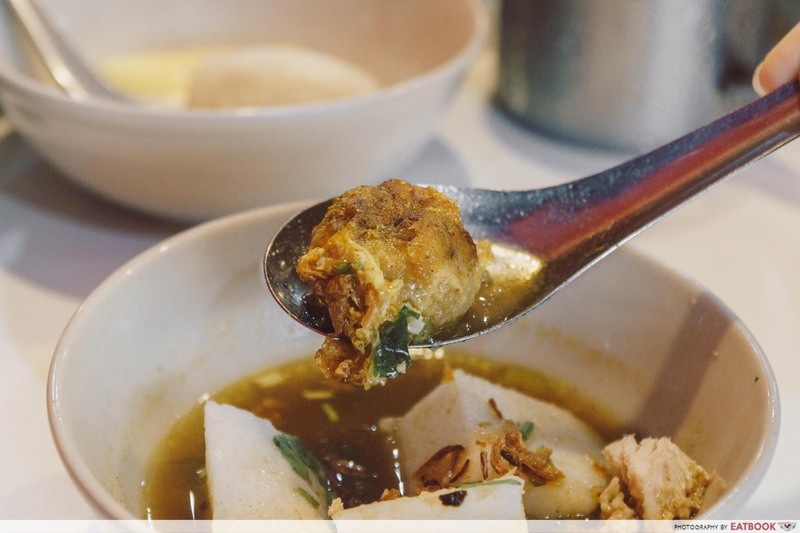 The lontong features a coconut broth along with cold compressed rice cakes, cut into three bite-sized pieces. Slapped atop is a dollop of sweet and spicy sambal chilli which imparted a much-needed kick of spice. 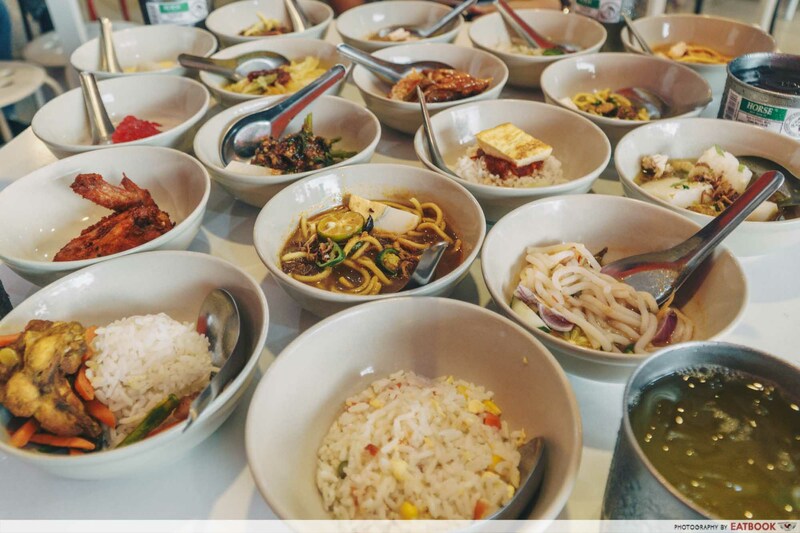 The mee rebus and nasi lemak were pretty average and didn’t give us anything to shout about. Other than the carbs, the only protein would be from the eggs. Another item on the menu you must order is the Mee Bandung. A common misconception is that this noodle originated from Bandung, Indonesia. However, the word ‘Bandung’ in this case is a term used to describe a mix of ingredients. Exhibit A: the rose syrup and milk beverage. Exhibit B: mee bandung. There are many variations of mee bandung. The one at Kafe Eat & Repeat is made with egg noodles, fishballs, and a delicious peanut broth. 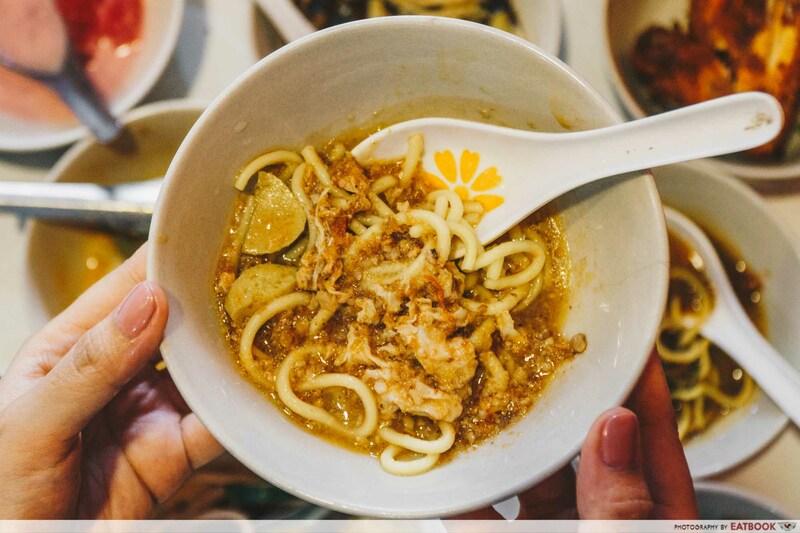 Unlike mee rebus which has a thick and viscous gravy, mee bandung has a semi-clear broth peppered with coarsely chopped peanuts. It was sweet, savoury, and mildly spicy. 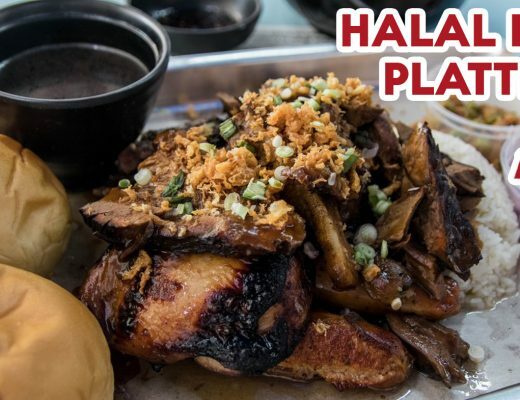 We were recommended their signature – Nasi Putih Ayam Paprik. I challenge anyone to take more than a minute to finish this. The melange of sweet and spicy flavours from the sticky, caramelised glaze wraps itself around the chicken, carrots, and long beans. You get your meaty fix, followed by a chilli hit and a sweet aftertaste. 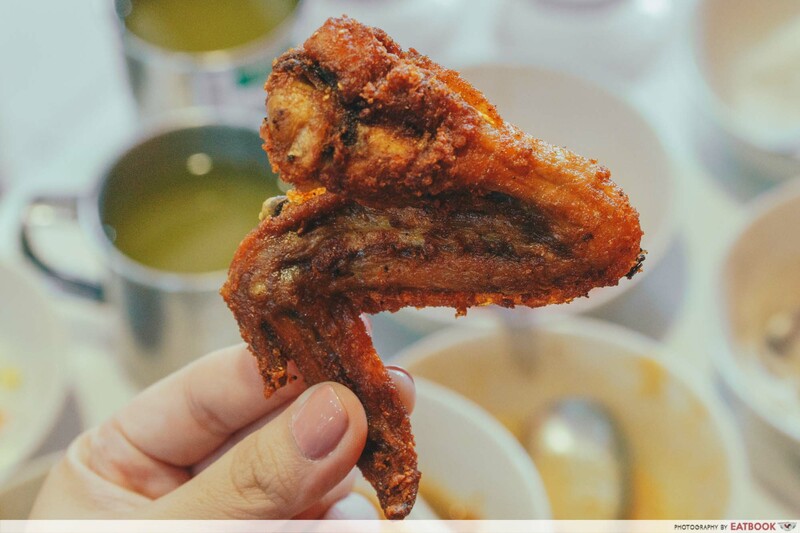 Another notable mention is the Kepak Ayam Tandoori. Again, don’t let the name fool you as these wings did not remind me anything of tandoori chicken. Blasted with hot oil, the skin of the chicken is so crispy, it might hurt the roof of your mouth. Taking a bite, you will be surprised by the fragrance of the marinade, which carried hints of garlic and turmeric. Desserts, however, paled in comparison to the savoury items. 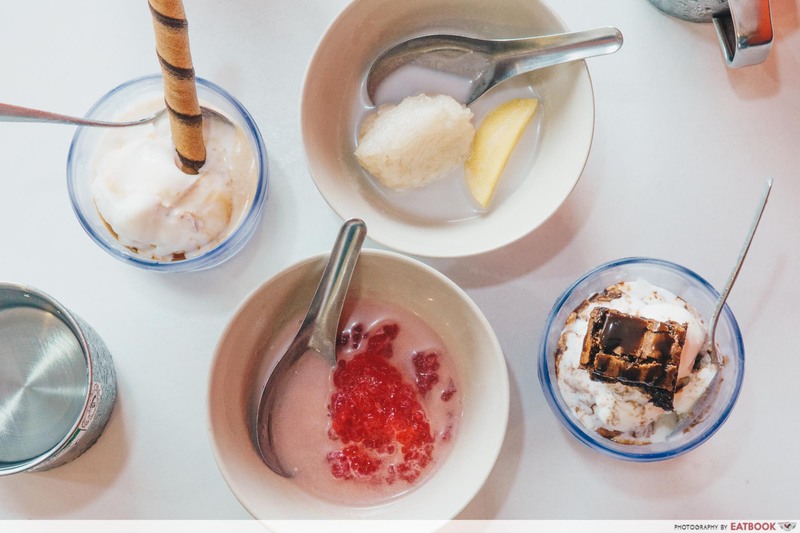 There are only four in the menu: Pulut Mangga (mango sticky rice), Sagu Gula Melaka (sago pudding), Brownies + Ice Cream, and Ice Cream Kuah Kopi. 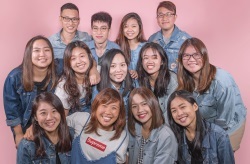 Leave your BKK-dreaming days at the door. The pulut mangga was missing the punch of summer sweetness as the mango slice was sour, and the sagu gula melaka was just flooded with diluted coconut milk. Order the ice-cream desserts instead. They might not be great, but they will definitely satisfy a hungry person with a sweet tooth. 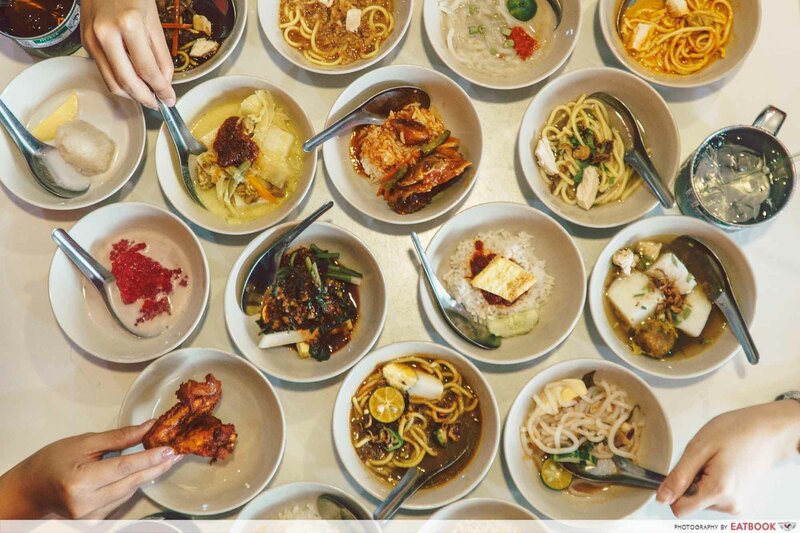 Kafe Eat & Repeat is a 15-minute drive or RM12/~S$3.98 Grab ride from the customs. It is hard to miss the eatery with its bright red and black walls, extending from the storefront to the back of the store. Just like the no-frills, simple dishes served here, the ambience is only good for having fabulous food in a jiffy, so do not expect anything more than basic IKEA table and chairs. 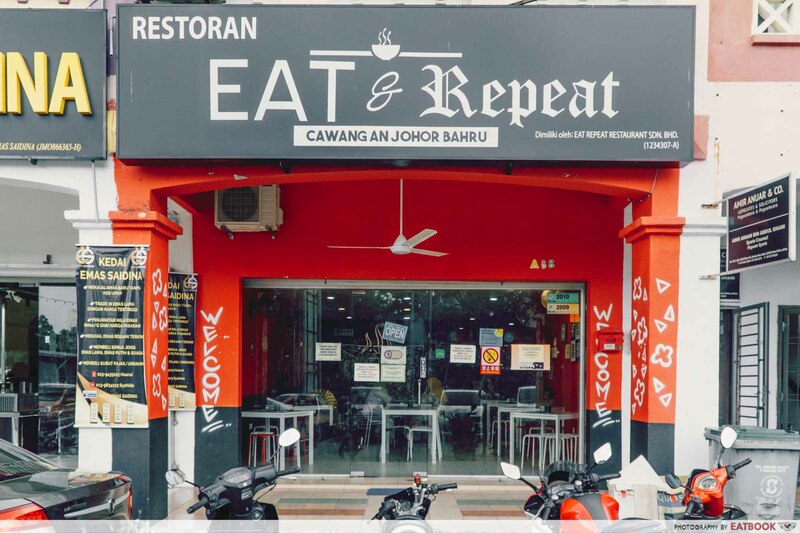 Kafe Eat & Repeat is a great place to bring friends who are first-timers in JB. 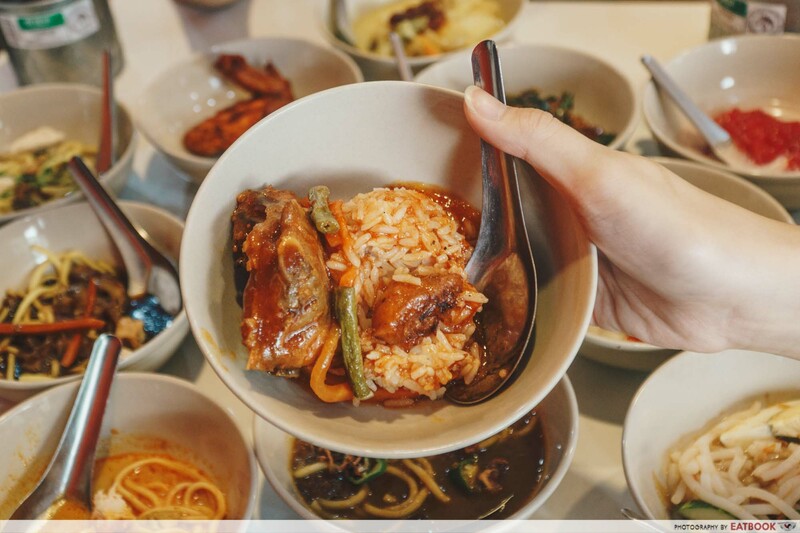 Expose yourselves to a huge part of the Malay cuisine here in one shot, without having to over order since each portion is small. 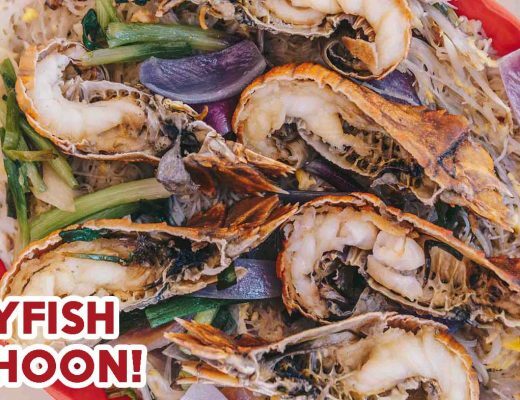 For more places to eat in JB, check out this list of Johor Bahru seafood restaurants with crabs and lobsters from $2.30 per 100grams! Kafe Eat & Repeat is a Muslim-owned eatery. Photos taken by Stephen Kim.